A wildfire in Ireland has uncovered a World War II-era landmark that was hidden for years by undergrowth. 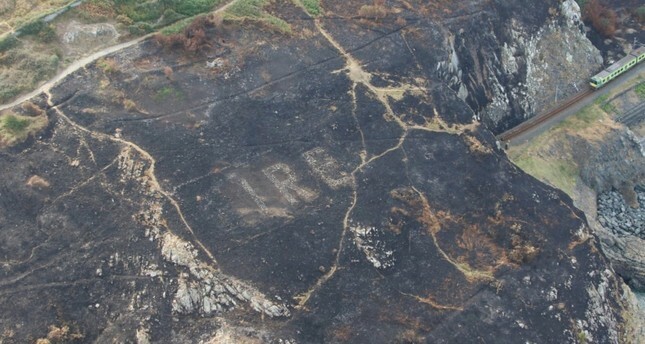 An Irish police air unit spotted the word Eire, which means Ireland, while surveying the damage caused by a fire on Bray Head, a hill located some 20 kilometers south of capital Dublin overlooking the Irish Sea. More than 80 such signs were created during the war to alert both Allied and Axis pilots that they were flying over a neutral country. Local reports cited an air corps spokesman saying that the signs are common on Ireland's west coast facing the Atlantic Ocean but unusual on the east coast. The Irish Air Corps says the Bray Head sign was No. 8. The signs were reportedly numbered on the request of the U.S. Air Force for its pilots to use them as navigational signs. Volunteers have restored some of the signs that were in plain view.